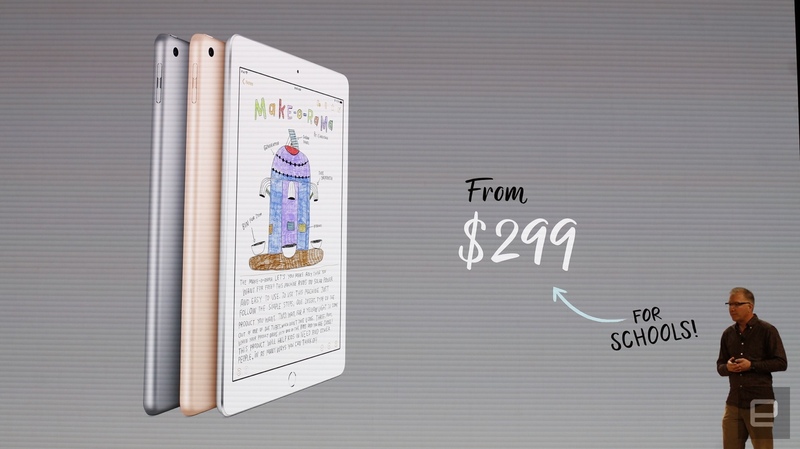 Earlier today, Apple announced a brand-new iPad. It has a 9.7-inch screen, an 8-megapixel rear camera, 10 hours of battery life, a front-facing FaceTime HD cam and an upgraded A10 Fusion chip plus support for Apple's Pencil. But the main talking point of today's iPad unveiling is the fact that it was done in a high school, in an education-themed event that was clearly focused on the classroom. 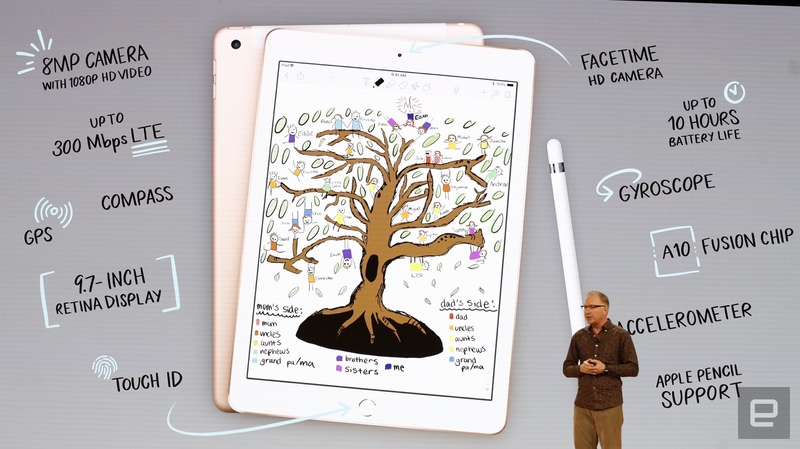 The pitch: Schools should invest in iPads. At $299 (and $50 to $99 more if you want to get a compatible stylus), schools might not have the budget to get both a tablet and a traditional laptop for students. With the financial constraints of most public schools, they probably have to pick one of the two. And while Apple's case for the iPad as an educational tool is a strong one, laptops remain a more sensible option for most students. Which begs the question: Why hasn't Apple made a low-cost Macbook for education instead? Apple is likely making a push into schools in an attempt to recapture some of its glory days in the education sector. Apple famously made a deal in 1978 with the Minnesota Education Computing Consortium (MECC) to supply 500 computers to schools, and by 1982, MECC was the largest seller of Apple computers in the country. Steve Jobs told Computerworld in a 1985 interview that "one of the things that built the Apple II was schools buying Apple IIs." It used to be that Apple computers were commonplace in learning institutions, with Macintoshes and eMacs present in schools and universities across the country throughout the 1980s and early 2000s. Much of that was due to efforts such as large-scale computer donations, deals with top colleges, and making eMacs (and other models) a little less capable and more affordable than the rest of Apple's consumer lineup. In the mid-2000s, Apple did make a low-cost Macbook for schools... sort of. It was the basic polycarbonate Macbook, and while it was initially intended for consumer audiences, it was still marketed and sold in schools as a low-cost alternative. When they were taken off the retail shelf in 2011, Apple still sold them exclusively to educational institutions for around $900 per machine. In recent years, however, things have changed. According to a recent survey by FutureSource Consulting, Apple has fallen to a distant third behind Google Chromebooks and Windows PCs in the education market. That's because Chromebooks and PCs are more affordable. In an effort to make its products sleeker and faster, Apple's done away with most of its entry-level products. The cheapest Macbook right now, for example, is $1,300, which is definitely not a budget laptop by any stretch of the imagination. If you want the cheapest retail laptop Apple sells, you can pick up a new Macbook Air for $999, but that's still a hefty price for students. So why can't Apple make a cheap laptop? "Theoretically Apple could do this, although the first step they would have to take is to reduce their profit margin," said analyst Rhoda Alexander from IHS Markit. "However, that profit margin is a key component of Apple's success, allowing Apple to constantly reinvest in the brand, driving innovation and R&D across hardware, software and content development." Apple could also make cheaper laptops with plastic cases and cheaper CPUs, but making mass quantities of cheap hardware doesn't seem to be part of Apple's current strategy. "There are other compromises they could make at the design and component level to reduce their cost, if their end goal was to drive unit volume," continued Alexander, stating that Apple likely wants to maintain a "premiere standard across the entire brand line." 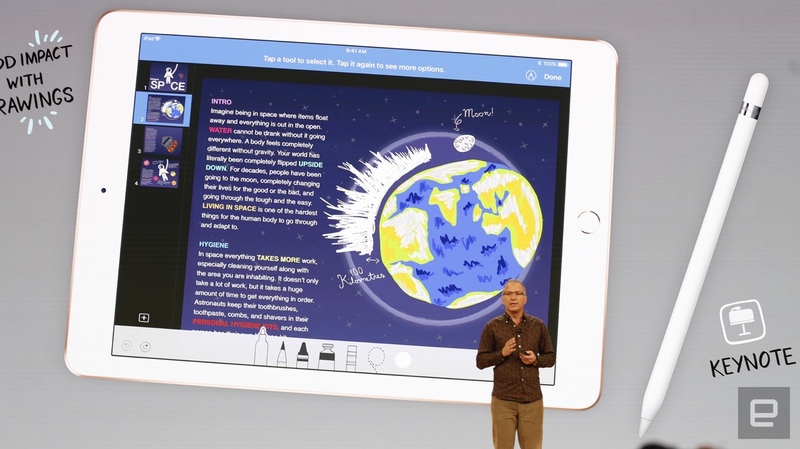 Which seems to be why Apple seems to be so keen on iPads as part of its education strategy. Not only are the tablets portable, lightweight and easy to use, they're also part of Apple's "post-PC" narrative, where most tasks only need a touchscreen and an accessory or two. In a way, it makes sense. When Engadget tried replacing a laptop with an iPad Pro for a week, we found it to be surprisingly effective, letting us do most tasks with ease. No, it didn't quite replace a laptop for us -- batch-resize images was a struggle, for example -- but it was close. And for kids, that might be good enough. The fact that so many parents already use iPads with their kids should not be underestimated. After all, this is a device that many children are already familiar with, and moving from what you have at home and bringing the experience to school makes sense. While laptops and keyboards are what we as adults are familiar with, children who grow up with hand-me-down tablets will be more adept with touchscreens. 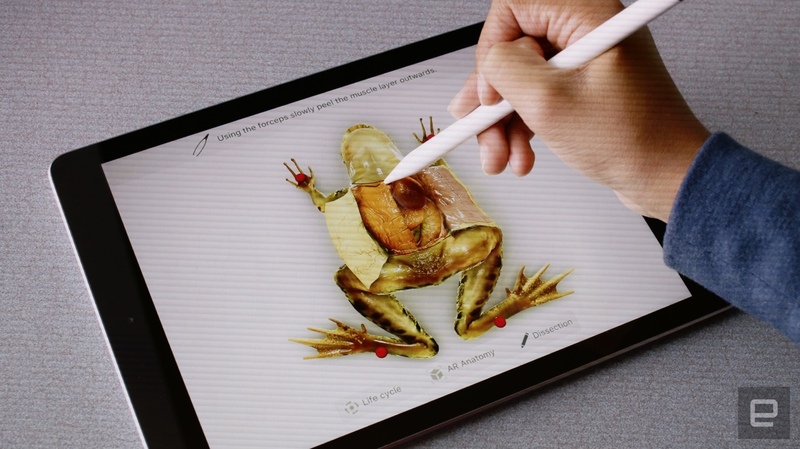 Combined with just how many educational apps there are available on the iPad, it's no surprise that Apple sees the iPad as key to getting back into classrooms. Yet, the cost is a barrier. Given the choice between a $300 iPad and Chromebooks that start at $150, it'll be hard for schools to pick the former over the latter. Sure, one has sleek and powerful apps, but the other has a keyboard, with all the important functionality, for a cheaper price. Apple could make a student-only iPad or Macbook just for the educational market, perhaps constructed out of a durable polycarbonate. As long as there was enough performance and power to properly run any and all educational apps as well as Apple's own productivity tools without hiccups. It might not be as shiny and glossy as the iPad announced today or the current Macbook line, but it wouldn't need to be. But the reality is, we probably won't see anything like that anytime soon. At the end of the day, Apple has stuck to its guns as a purveyor of high-end electronics. It would be very unlike Apple to suddenly produce cheaper budget versions of its hardware just to keep up with its rivals (the iPhone 5c didn't last long, remember). Which is unfortunate, because that might be what it needs to do in order to convince more schools to switch to iPad.